Construct bridges with wood, steel and rope so that the creatures can reach the flag in each level. Jerry is hungry, but Tom is guarding the kitchen. Can you help Jerry get some cheese? Build bridges using any material you can find, and help Jerry get across the kitchen. Be careful though, if your construction isnâ€™t strong enough, Jerry will fall and Tom will catch him. Snail Bob is back and needs to deliver a present to his grandpa! Help him through his adventure by constructing his path in this point and click game. Become the greatest builder in the world. Use all your construction skills to help you workers safely move cargo from the other side of the valley in this thrilling free online physics game. Everyone's always sleeping in this Royal Kingdom. Position wooden pieces so as to wake up the royal family in this fun construction puzzle physics game. Click, drag and rotate the ramps to construct a pathway to safely guide the spheres into the goal. This is a network logic puzzle game, plumber style! Connect the pipes and run the water to feed the thirsty dog below! Use the sticky bacteria colonies to build structures like bridges and towers. You must guide them upwards and remain over the threshold for 5 seconds without falling down! How smart do you think you are? Rotate the 3D shapes to try to discover how their interlocked with one another. Then drag them apart. This 3D physics puzzle game will keep you hooked. Construct the pathway for the ball to reach the basket. Use your puzzle skills to place gears, bricks, wood and more to build smooth systems and complete the series of challenges. You will need all of your imagination and creativity to build your fantastic contraption. Get the key block into the goal. Design and create your very own robots and watch them come to life on your screen then use them to build your own mini-games! The King of Shapes enjoys getting up to mischief with his servants. Help the king raise his servants above the drop line by building towers and platforms out of brick and wood. Then drop the servants into their coloured basins to score points in this fast-paced puzzle physics game. Use various sports balls to run all kinds of outstanding physical experiments in this funny physics puzzle game. Adjust the equipment to ensure the 8 ball reaches the goal's flag. Carefully place the game pieces to control the flow of water. Fill each level's container with exactly the right amount of water if you want to progress to the next puzzle level! Construct a pathway or the energy by connecting the energy pods with the available pipe pieces. Careful about wasting energy though, ensure that there are no exposed pipe ends. Pigs really can fly with a little help from some potion. Use multicoloured cursors to help the pig reach its potion in this addictive 30 level game. Take advantage of gravity, friction and inertia and let these forces give power to the shapes that you draw. Master each level by collecting all the flags. Make red and green objects collide with others to create a masterful chain reaction in this online physics game. Be electrified by this captivating puzzle physics game. Use all the tools in your inventory to build a path for the electrical current. You'll really need to think outside the box! Have fun splatting all the zombies in this physics based zombie shooter game! Test your stacking and balancing skills with this timed physics game! Stack all of the given shapes so that they remain on the screen until the timer expires. Drive all blobs to the bucket by dragging available objects into the right position. 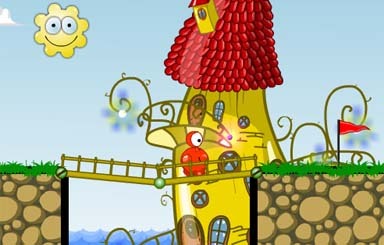 Avoid obstacles and enjoy 20 levels of fun physics puzzles.